I've read much of your commentary with regard to vehicle partitions and and the dangers they present to occupants. You are right, Steve! Keep up the good work!!! Baltimore is in a position to correct a nationwide problem. Slamming the brakes, waffling, noodling, nor the 'rough ride'... may never end, unless prisoners are always restrained and all the vehicles' interiors are in compliance with federal standards. Mosby needs to keep up this good fight to enhance prisoner safety, not just for the safety of prisoners alone. The sword cuts both ways. Scores of police officers have been victims of partition injury in rear end collisions, incinerated after being rendered unconscious by the partition hitting the back of the head, and died when the car caught fire. Ask Jason Schecterle. A Phoenix AZ police officer. He was extracted by witnesses, while on fire, from a burning cruiser. He was unable to get out by himself, he was knocked out by the partition. Gray needs justice. Try and convict the guilty driver and others. Goodson needs to be sentenced to 30 years in prison. Another doctor alarmed about partition dangers, but still dumb or apathetic enough to still ride in partitioned cabs!!! Riding in a taxi without a seat belt isn't just a big city public health problem. Thanks to the popularity of car-hailing services such as Uber and Lyft, everyone's sliding into the backseat of a cab these days. In private cars, you know to buckle up. And you're not alone: 87 percent of Americans use a seat belt, according to the latest national survey from the Department of Transportation. Paradoxically, that changes the minute a car is driven by a stranger: According to a 2014 New York City Taxi and Limousine Commission survey, 57 percent of taxi passengers don't buckle up without prompting. What's more, 46 percent of passengers who don’t wear a seat belt in taxis do wear one when riding in private cars. Lyft doesn't collect seat belt data and Uber didn't respond to requests for comment, but if the New York taxi survey is any indication, this is a widespread car safety issue. Ozlem Simsekoglu, an assistant professor who specializes in traffic and social psychology at the Izmir University of Economics in Turkey, said taxi passengers may correlate taxi drivers' long hours behind the wheel with better driving skills and assume that the probability of an accident is very low -- especially if the passenger is only traveling a short distance. In reality, riding in a cab without a seat belt is dangerous. Though a 2004 study found that New York City taxis had a lower rate of accidents than private cars, even a simple fender bender can cause grievous facial injuries to unbuckled passengers, who can slam into the taxi partition face first if they aren’t held back by a seat belt. And the danger doesn't end there: CBS News correspondent Bob Simon was killed in a livery cab crash in Manhattan in February, only two years after the deaths of two newlyweds in a livery cab crash in Brooklyn. 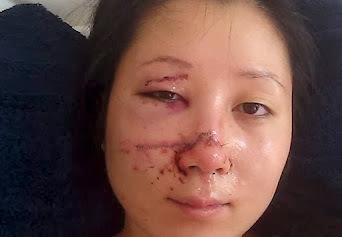 Though the resulting injuries can be grisly (one New York City woman needed 50 stitches after a 2012 crash according to White, they are extremely preventable. “The very act of wearing your seat belt to prevent that forward momentum and the individual’s face hitting the acrylic glass is enough,” White says.